Nailstyle: Zoya Yara - and an attempt at stamping! Today's mani follows on from my Zoya haul. 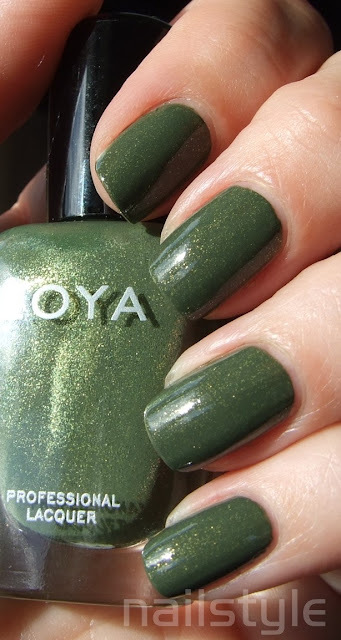 This lovely polish is Zoya's Yara and is a super pigmented (like Neeka) polish that is almost opaque in one coat. This shows two coats and I've been trying to perfect cleaning up around my cuticles with a paint brush dipped in acetone. Yara is very easy to apply and is a gorgeous dusty olive green with loads of gold shimmer. It still looks cool! Not all things we try come out like we want them to! I like this! Lovely color and mani! You shouldn't be disappointed, it look really good and neat! I love that Zoya. I wore it yesterday!